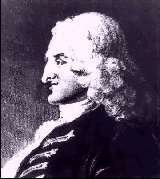 Henry Fielding was an English playwright, novelist, satirist, and lawyer. He is considered one of the fathers of the English novel for being the first to advocate character development and classical structure. He often published his works using the pseudonyms Conny Keyber or Scriblerus Secundus. Fielding's father was Colonel Edmund Fielding, a descendant of nobility, and his mother was a daughter of a judge of the Queen's Bench. At the age of three, his mother inherited an estate and the family moved to Dorset. She died before he turned eleven, and when his father remarried, Fielding was sent to Eaton where he studied literature, graduating in 1725. At seventeen, Fielding moved to London where he became interested in the theater. He launched his first production in 1734, Love in Several Masques, which was not well-received. Fielding, therefore, attended University of Leiden in Holland, but when money from his father ran out, he returned to London. Over the next nine years he wrote and staged more than twenty burlesques and farces. His plays satirized political and social trends and figures of the day, often overstepping acceptable bounds. In Pasquin and the Historical Register for the Year 1736, he openly attacked Prime Minister Robert Wolpole, resulting in the Licensing Act, a form of censorship for the stage. At this point, Fielding turned from the theater to law in order to support his family. He completed his studies in half the normal time and was called to the bar in 1740. Unfortunately, his honest law practices made him a less than successful lawyer. To supplement his income, he started writing again. In 1741, he anonymously published two works: An Apology for the Life of Mrs. Shamela Andrews and Joseph Andrews, ridiculing one of Samuel Richardson's works. The works were extremely popular, which enraged Richardson and created a feud between the authors. Late in his life, Fielding suffered from gout, which often forced him to use a wheelchair or crutches. After the death of his wife in 1744, Fielding married her maid, Mary Daniel, who was also a writer. He came back into favor with the government for his publications of True Patriot and The Jacobite's Journal. The government bought two-thousand copies of these propaganda pieces, which earned him the position of London magistrate and the justice of the peace for Westminster in 1748. This position came with a home, but no money. It was generally accepted that the magistrate could take bribes, but Fielding's honesty, again, prevented him from making a decent living. While in public office he wrote Tom Jones, which is considered one of the greatest works of English literature. The novel chronicles the adventures of well-intentioned, but imprudent orphan, Tom Jones, after he is banished from his guardian's estate. In this work, Fielding uses his characters to reveal universal truths about human nature. Despite failing health, he continued his duties in law enforcement with considerable success. There were no murders or street robberies committed in November or December of 1753. He retired the next year in the better climate of Portugal. He wrote about the trials and tribulations of sea travel in the eighteenth century in his book, The Journal of the Voyage to Lisbon. He died shortly after his arrival in Spain, and was buried in an English cemetery.